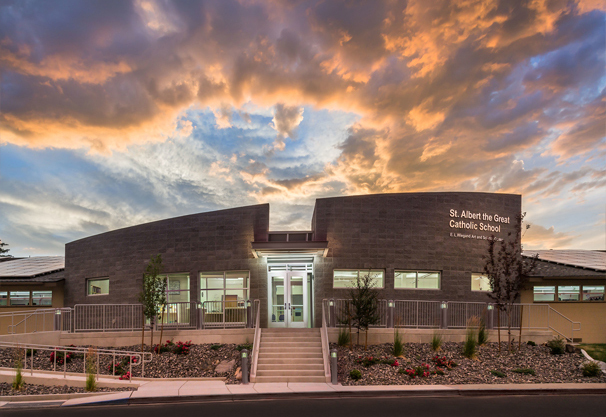 Saint Albert the Great School’s addition received an award from the Concrete Masonry Association of California and Nevada (CMACN) and the American Institute of Architects, California Council’s (AIACC) 2017 Concrete Masonry Design Awards. Saint Albert the Great School was in desperate need of a secure and pronounced entry. 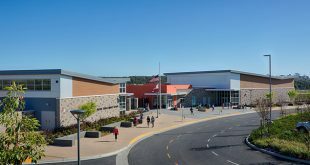 The existing school was built in the 1960s with concrete masonry units and the owners wanted the entry to make a statement, but also be cohesive with the existing structure. The owners appreciated the durability, low maintenance, and aesthetics of split-face CMU for the exterior. The exposed interior walls were composed of shot-blast CMU that provided a tactile-friendly surface and more closely matched the hue of the exterior split-faced material. With only a two-month construction window, the proximity of the production plant and availability of CMU was crucial for the schedule. The texture, along with the ant-graffiti sealant on the exterior helps provide relief from vandals. The front wall is based on a 79′-0″ radius and is also raked on a 3:12 slope, tying the school with the aesthetics of the nearby Church to create a cohesive campus. 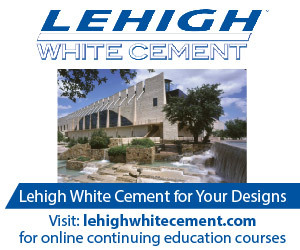 The major materials used during construction were within 500 miles of the construction site and contained recycled content in the steel and concrete. The single-ply roofing membrane is in compliance with the heat island effect and the site lighting is within the dark sky requirements. The existing facility contained PV panels on the roof and the new addition increased the number of panels. On the interior of the building, low emitting materials and low VOC paints were used throughout. All lighting in the facility is LED to reduce operating costs. The R-value of insulation within the walls, foundation and roof exceed the basic requirements. The original exterior walls were not insulated, so the new addition exterior walls were furred to create a space for insulation to help with energy conservation. The final landscaping contained drought tolerant planting materials.